Bunaíodh Ionad na nIarratas ar an An tIonad Iarratas Iarchéime (PAC) sa bhliain 1998 le freastal a dhéanamh ar iarratais ar chúrsaí iarchéime sna ceithre chomhcholáiste d’Ollscoil na hÉireann. Is é cuspóir an Ionaid glacadh le hiarratais ar an Máistir Gairmiúil san Oideachas (NUI) sna hollscoileanna sin agus na hiarratais sin a phróiseáil. Déanann PAC bainistiú ar an bpróiseas seo. 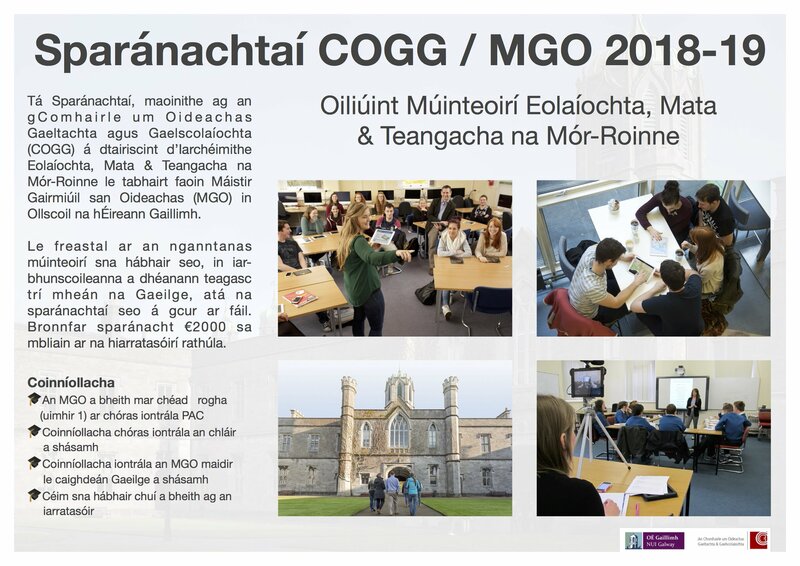 The Máistir Gairmiúil san Oideachas NUI Galway for 2019 entry is now open until the 13th May. A new Minimum Requirement of H 2:2 in Primary degree or equivalent (for example Degree + Masters) for all PME programmes is now a requirement. New Application Deadline: 28 February 2019 (€100,fee) for all applicants. A new Subject-based application/selection system will be in operation. Students will continue to rank PME programmes by University preference. This is a very positive and new development as selection will be based on individual specified programme preferences, teaching subjects and priority subjects identified by the DES Teacher Supply Steering Group. Is gníomhaire é Ionad na nIarratas ar An tIonad Iarratas Iarchéime (PAC) do na hollscoileanna ar fad atá páirteach sa chóras. Glacann na hOllscoileanna ar fad atá páirteach sa chóras lárnach leis an amchlár, leis na nósanna imeachta agus leis na rialacha, go bliantúil. Níl san Ionad Iarratas Iarchéime (PAC) ach gníomhaireacht riaracháin agus níl aon chead ag an Ionad aon athruithe a dhéanamh ar na nithe sin agus caithfidh an tIonad a chinntiú i gcónaí go dtugtar cothrom na féinne do gach iarratasóir agus nach dtugtar tosaíocht d’aon iarratasóir a chuirfeadh as do sheansanna iarratasóra eile.Níl san Ionad Iarratas Iarchéime ach gníomhaireacht riaracháin agus ní thacaíonn an tIonad le haon cheann de na cúig chúrsaí atá sa chóras, thar a chéile. Tá iachall ar an iarratasóir a chinntiú go bhfuil an cúrsa a roghnaítear oiriúnach dó/di. Cliceáil anseo le haghaidh eolais Sparánachtaí COGG.